It's a few days before Christmas, Hanukkah, and Kwanzaa, and all through my house, not a creature is stirring, not even a mouse. Why? Because it's freezing outside! So, what better time to veg out on the couch and settle in for a long winter's holidaze by streaming some cheer from Hoopla? Their curated collections provide hours upon hours of streaming movies, music, and television shows, as well as ebooks, audiobooks, and comic books to celebrate the holidays right on through to the new year. And the best gift yet? It's all FREE with you Free Library card! This list is full of fun animated and live-action children's Christmas movies, from recent additions like How to Catch an Elf and The Nutcracker Sweet to lesser-known fare like A Muppets Christmas: Letters To Santa, and even the Disney classic Babes In Toyland. Children can learn about the traditions and cultures behind Hanukkah by celebrating with these animated shorts, including the cute and appropriately titled Latke, the Lucky Dog , Hanukkah Bear, and Shalom Sesame Street. My pick out of this category is the outstanding adaptation of Hershel and the Hanukkah Goblins. 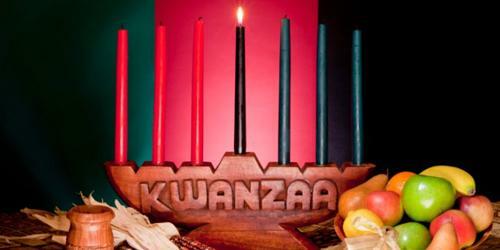 Whether you're celebrating Kwanzaa or just want to find out more about the history and traditions behind the holiday—which itself is celebrating its 50th anniversary this year!—Hoopla has some great ebooks and audiobooks for you to check out, such as Seven Spools Of Thread, Seven Candles For Kwanzaa, and even books with Kwanzaa crafts. How many versions and adaptations of A Christmas Carol and The Nutcracker can you watch? Start binge-watching now and we'll see you in the New Year! What's cuter than a furry, four-legged friend? One with a Santa hat on, of course! Ho Ho Howl along with movies like The Dog Who Saved Christmas, 12 Dogs Of Christmas, and Santa Claws! Looking for that perfect gift for someone this holiday season? Maybe you just want to try your hand at a new craft or learn how to bake some cookies? This list of crafty and cooking ebooks is a real holiday treat! Read and laugh along with Garfield, Scrooge McDuck, and the pint-sized superheroes of Li'l Gotham as they celebrate the holidays in full-color, illustrated stories. My personal fav here is this Nightmare Before Christmas manga! It seems every musician has at one time or another put out a holiday recording, so there's plenty of genres to choose from here: heavy metal holiday hits from Twisted Sister; rockabilly, big band seasonal swing from The Brian Setzer Orchestra; cozy and comforting pop sounds from The Carpenters, adult contemporary crooning from Michael Bublé, canine caroling from the K-Tel novelty classic Barking All the Way - A Canine Christmas, and the holiday musical grab bag of the NOW Christmas compilation, to name just a few. If you like your holiday music a little more orchestral and operatic, then this is the collection for you. Choose from recordings by the New York Pops, Boston Pops Orchestra, Luciano Pavarotti, André Rieu, Measha Brueggergosman, The Vienna Boys' Choir, and many more. Season's Greetings to all and to all a Happy Hoopla Holidaze! Have a Happy Hoopla Holidaze! 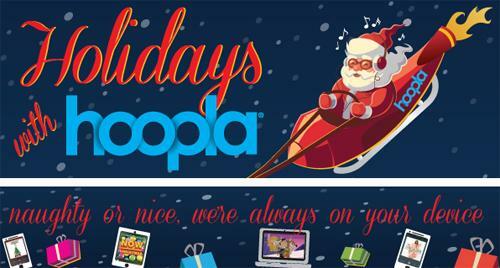 Add a Comment to Happy Hoopla Holidaze!